PATRICK EWING ATHLETICS 33 HI MENS BASKETBALL SNEAKERS! 17 COLORS AVAILABLE!!! 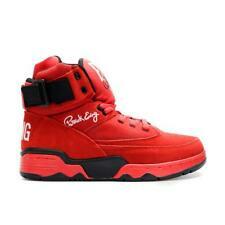 PATRICK EWING ATHLETICS 33 HI Red/White/Black Size 10M. Condition is Pre-owned great cosmetically. 9.5-10. They were worn once for maybe half hour. Shipped with USPS Priority Mail. patrick ewing 33 hi. Condition is Pre-owned. Shipped with USPS Priority Mail. Patrick Ewing 33 HI "BRED" MENS NEW LIMITED EDITION 1EW90165-005 100%AUTHENTIC! Almost brand new worn twice. Take them off my hands they will look great on you ! Size 10.5 Ewing Hi Burgundy sneakers. Worn a couple times. Original box and tissue paper, key ring ball, and tag. Feel free to HMU with any questions you may have. PATRICK EWING ATHLETICS 33 HI Black Suede/White "OG"
Cushioned lining and padded tongue add extra comfort around your feet. Cushioned midsole ensures you get the best form of comfort every step you take. Solid rubber outsole grants grip and traction on all surfaces. Condition is Pre-owned. Ewing Guard “ Sunflower “ size 7. The sunflower seed colorway is one of the most sought after. Really nice suede. 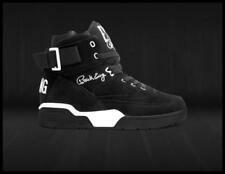 Very cool rugged Ewing athletics release. GREAT DEAL! ACT FAST! Purchased directly from Flight Club NY in store. Sneakers are in great shape, see photos for yourself. Box is damaged on one corner. Sneakers ship double boxed. Condition is Pre-owned. Ewing 33 Hi Burgundy Suede sz8. GREAT DEAL! ACT FAST! SNEAKER STEAL! 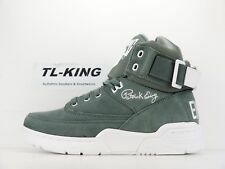 PATRICK EWING33 HI New In Box Size 10,5 Mens St. Patrick’s Day. Condition is Pre-owned. Shipped with USPS Priority Mail. Retro 2015 Patrick Ewing 33 HI All Star suede size 9.5 Signs of use, scratches, nicks, dings, etc. No rips or tears. some stains (see photos) Good tread on soles. Overall in Good usable condition. Please refer to the pictures. Please ask any questions. The item is sold as is. Thanks for looking. 100% Authentic Men’s size 10 (shoe box says 10.5, but the company I bought them from sent the wrong size, both shoes are a men’s size 10) very near Deadstock. Worn once Patrick Ewing 33 Hi Royal Blue Suede Orange White Size 10 VN DS. PayPal only. All sales are final. More pictures can be sent on request. Adult signature required on delivery. 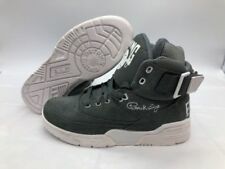 Pre- Owned Patrick Ewing Vintage Basketball Sneakers Size: Men 13 Model: Ewing’s Athletics Wrap 1EW90103-968 Color: Black Suede , Light Gray Mesh, Orange And Green Rubber *** Great Condition. Shoes have been worn and but in great condition. Minor scratches and creases do to use. Do not have original box. **** Please see photos for condition *** Happy Bidding!!!! 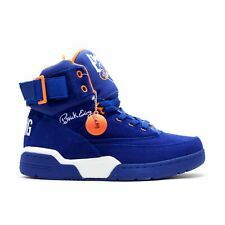 (Original Patrick Ewing Athletics 33 Hi Top Blue/Orange/White Suede Sneakers Model 1VB90013-449 - Sz 8.5 US (41.5 EUR) - Does not include original box. up to 4 lbs). PATRICK EWING ATHLETICS 33 HI White/Black/Green/Yellow Jamaica OG Mens Size 11. Condition is New with box. Description: The flagship Ewing Athletics shoe, the 33 HI is an exact retro of the 1990 original, and features a classic reversible ankle strap that can be worn on the front or back of the shoe, and a full length PU midsole for cushioning. This classic OG color pays tribute to Patrick's birthplace of Kingston, Jamaica. Features a white leather upper with black,green,yellow and red accents along with a Jamaican Flag at the heel. Leather Lace Up Basketball High Top Sneakers. Well Loved Condition. Shows obvious wear. I washed the shoes, didn't help much, they are re-freshed but still look well worn lol. In 10/10 condition, Ewing 33 HI purple colorway up for grabs in size 12. Pre-Owened Patrick Ewing Suede Sneakers in Black, Purple, and Turquoise. This item is in fair condition. There are a few water stains on the suede. There is also some creasing on the soles around the arch of the bottoms. A good cleaning will have them looking great again! Please see close up pictures of defects. Ewing Concept Hi for Sale. This limited edition colorway was the exact one worn in the 1990 season by Patrick and features a premium Red suede upper with Black and White accents set atop our classic sole. ewing athletics 33 hi Size 16 Custom Rear Thick Padding Removed Permanently. It’s a nice shoe size 16 for the bigger foot folk. Without the rear padding, the shoe fits better in my opinion, not so snug, and it doesn’t feel like you’re feet are bursting out of the shoe. You can also tie the laces tighter for a more proper ankle fit. The item being sold is the one seen in the pictures. For our apparel we send them in tissue paper and boxes. 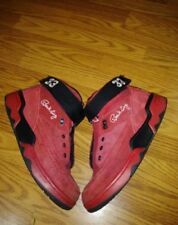 Great Condition Patrick Ewing Guard Athletics 33 Red Suede/White/Black Sneakers. They have almost no signs of wear and are in the original box. Patrick Ewing Athletics. 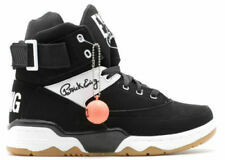 Ewing Wrap Basketball Sneakers. sneakers of VARIOUS. Still has the attached basketball! Ewing 33Hi Burgundy Suede.10/10 condition. Barely Worn. Comes with original box and materials. Everything is almost like new. Ewing Athletics Ewing 33 Hi Winter F. Roast Men's Basketball Shoes size 7 MEN Condition is New with box. Shipped with USPS Priority Mail (1 to 3 business days).